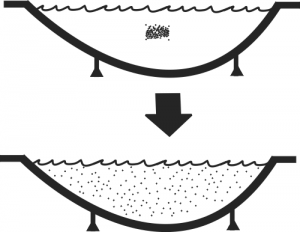 Diffusion is the process of particles distributing themselves equally across a specified area. Much like passengers on a bus, particles move from a crowded area to a less crowded area. They keep moving until they are more or less evenly distributed in the space available to them. When you wake up in bed and smell the aroma of a delicious breakfast on the stove you experience the results of diffusion. The microscopic food molecules have wafted from an area of high concentration, your kitchen, to an area of low concentration, your bedroom. The cells in your nostrils inform your brain something delicious is cooking and you know an aromatic meal awaits you. When you enter a tub containing bath salts you experience the results of diffusion. As the tub was filling with water, either you or someone who adores you, added a packet of bath salts to the water. The salt molecules scurried about until they were evenly distributed in the warm tub of water where they waited to soothe your aching muscles and to relax your tired body for a night of deep, comforting sleep. Diffusion also occurs in our head too; literally in our head, as it is the foundation of brain activity. Sodium and potassium ions move back and forth across neuronal cell membranes triggering bursts of electricity called action potentials. These surges of electricity are the foundations of thoughts, feelings and movements. Some forms of meditations employ the technique of concentration to focus our attention on a thought, feeling or object. The main reason for practicing concentration is to improve our ability to focus, to become one with the object of focus and to thereby push past the idea of a defined “self”. But, surprisingly, this practice produces another result that is the exact opposite of concentration: diffusion. The hope is that over time the effects of meditation slowly diffuse into our daily lives. The more we practice mediation the deeper it becomes. The intention is to let the calm and relaxed feelings produced by meditation diffuse gently into the chaos and stress of our daily activities. When we immerse ourselves in cheer and calm during mediation, and when we let that cheer and calm flow into other parts of our life, we see the possibilities of a more serene and sane existence. We notice how good it feels to NOT be stressed and uneasy. Once this revelation hits us, cheer and calm begin to diffuse into our regular lives. This doesn’t mean we will never be angry. We might still experience frustration when encountering an unreasonable person. We might still whisper a profanity when handling an emotionally trying situation. There might still be moments when we just can’t take it anymore. But with regular meditation, cheer and calm will inevitably diffuse into our daily challenges and the tranquility of meditation will permeate our entire life, from when we wake up to a delicious meal to when we go to bed after a soothing bath.